Anne, Greg and his friend Rob, Mick, Peter, Larry, Ray and myself have all done the Chatsworth Challenge at least once. I have walked it with Ray (1997 - 8 hours 17 minutes), Mick (1999 - 7 hours 49 minutes), Anne (2000 - 9 hours 4 minutes ) and myself (2001 - 8 hours 3 minutes). In 2001 I started with Greg, Rob; Mick, Larry and Peter but because of my advancing years and ageing legs they soon left me behind. Ah. 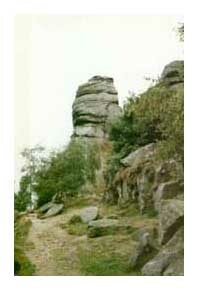 The "Chatsworth" is similar to the White Peak Walk. 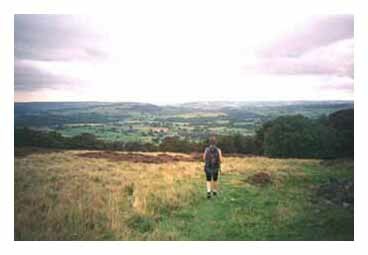 On both you have to ascend about 3,500 ft and both are predominantly in the Derbyshire White Peak. 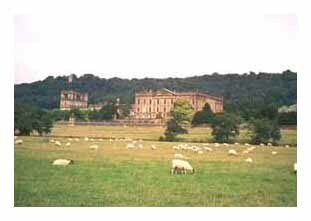 However, while the White Peak Walk is 26 miles long, the "Chatsworth" is only 25. And at my age that extra mile can make all the difference! The first time I did the walk I travelled with Ray the 80 or so miles from our homes to Baslow, Having parked Ray's car in the grounds of Chatsworth, we had walked to the Village Hall in good time for the 8.30 a.m. start and, having "checked in", mingled with the other walkers and drank tea before the "off". Eight thirty came. The starter's gun "fired". We, with about another 250 walkers, started to ascend the road opposite the village hall (Eaton Hill) that gradually narrowed to a rough path that would bring us out on Baslow Edge. Here we passed close to the Wellington Monument and Eagle Rock as we walked northwards towards Curbar Edge. This part of the walk is very crowded and although there is no jostling you find that walkers will overtake you only to be caught up and overtaken within a few 100 yards, or maybe not for 10 or 15 miles. I remember in 1999 when I walked it with Mick it was along this part of the walk where we were suddenly overtaken by a shapely female in lycra. Although it got Mick's adrenaline going we didn't catch up with her and overtake her until about 14 miles further on. The walk continues past Curbar Gap and just about where Curbar and Froggett Edges meet we go left down a very rocky track that will take us to the road near the Chequers Inn. When I did the walk with Anne a large number of walkers reached this track at the same time, which made the downward path crowded and more difficult. I was wearing a lightweight pair of boots with not a great deal of support and just as we reached the bottom of the track I went over on my right ankle. Fortunately it wasn't too bad and by tightening the laces I was able to continue, but I now take much more care when walking similar terrain. From here the walk continues westward over the River Derwent and up hill towards Eyam. However, before we reach Eyam there is a refreshment stop on the road that goes between Eyam and Grindleford. A very well received stop it is too. By now we have completed just over 4 miles of quite energy sapping terrain and, although it is September, most walkers are beginning to get warm and, having started to sweat, need to replace liquid. From here we continue up hill and just before Riley's Graves are reached the path becomes a lane that is followed down to Eyam. Eyam is known as the plague village and Riley's Graves are a reminder, along with other landmarks within the community, of the plague that devastated the population of the village in 1665-6. See www.cressbrook.co.uk/eyam/museum/ for more details of the plague. The next stop, and the first check point, is the Youth Hostel situated on the hillside to the North of Eyam. More drinks are taken, but I try not to spend too much time here as while I have the momentum I like to keep walking, but unfortunately it's still upwards. It was here in 2001 that I realised that I was not going to be able to keep up with Greg, Rob, Peter, Mick or Larry and told Peter and Mick not to bother waiting for me but to carry on at their own pace and I would do likewise. My old legs always have trouble on the hills and that day was no exception. However, soon this "pull" is behind and you're walking on Eyam Moor, often accompanied by a refreshing breeze, before starting the downhill journey to Abney Clough. It was here in 2000 when I was walking with Anne that the first of the Runners, which start 2 hours behind the walkers came thundering past. I don't know how they do it. Certainly made both Anne and I realise how unfit/old we were. From the bottom of Abney Clough it's about a mile to Abney Village Hall which is Check Point No.2. In 2001 it was "touch and go" whether the walk would take place. Many challenge walks earlier in the year had been cancelled because of the Foot and Mouth outbreak and it was only at the last minute, after having obtained the co-operation of all the farmers whose land the walk went through, that it was decided the "Chatsworth" would go ahead. However, at the top of Abney Clough it was necessary to do a minor detour so we did not pass through a small herd of cattle, but other than this and our boots being dipped in disinfectant a couple of miles into the walk all was as in previous years. From Abney it is now more or less due south to Great Longstones. 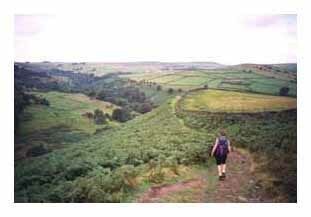 However, the first part of this consists of a steep walk down into Bretton Clough and then an even steeper walk out. However, by the time the road is reached at Bretton, although only a little more than 10 miles have been completed, I always feel elated because I reckon about 70% of the up hill work is behind. In 2000 when I was walking with Anne the owner of the house adjacent to the right of way just before the road asked Anne if she would like a lift in his wheelbarrow. She obviously looked a little jaded. She refused but as often wondered how far he would have taken her if she had accepted! The next check point is at Housley Crossroads and we follow the road, via Foolow, to get there before taking the path over Longstone Moor. This is very pleasant walking and although it goes up hill it's not too difficult but the wall stiles I could do without. Anne, who is only 5ft 6in, would also have preferred not to have had to negotiate them. Fortunately every time I have done the Chatsworth the weather has been fine. A slippery wall stile could be very dangerous. Just has you come off the moor there is a very steep decent. 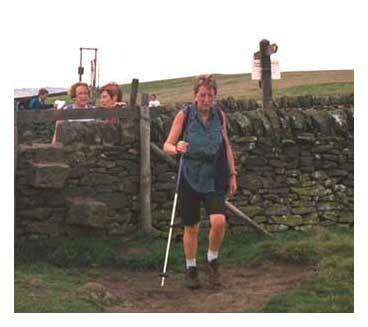 In recent years I have tended to use two walking poles on the walk and they are certainly helpful in getting down this slope, although they can be a nuisance when clambering over the stiles. 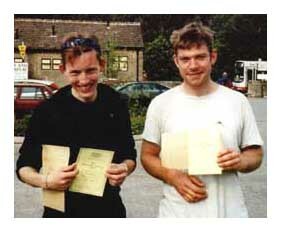 By the time the checkpoint at Great Longstone is reached almost 15 miles have been completed. Although this checkpoint offers an opportunity to sit, have a rest and take on more liquid I'm not keen on long breaks so it's usually a very quick stop and away again. 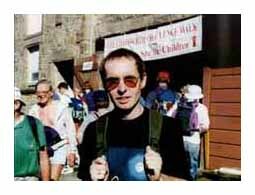 It was quite noticeable during the 2001 walk how groups would often pass me between checkpoints, particularly over hilly terrain, but they invariably lingered longer than me at the "stops" and I would get in front again as they rested and took refreshments. Soon the Monsal Trail is reached which is followed to the checkpoint at Bakewell Station before the "trail" is left to follow the path that leads to Rowsley and on to Rowsley Bar Wood, the penultimate check point. From Rowsley Bar Wood to the last checkpoint at Beeley is only about 1½ miles. However, most of the walking is through woodland with a couple of steep climbs but as you leave the wood and head downhill towards Beeley it's wonderful to think the last of the up hill work has been completed. But it's not all over. Going downhill from the wood pulls on your legs and I'm pleased to have the "poles" to help reduce the strain on aching knees. Beeley Check Point is reached and it's less than 3 miles to the end at Baslow. The going is easy. Initially you walk to the road bridge, near Calton Lees that takes you on to the west bank of the Derwent. The river is followed upstream and you are able to enjoy the grounds of Chatworth on the other bank. In 2001, just as I reached the next bridge, which took me over to the east bank, who should I see in front of me but Larry. 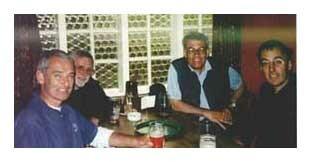 He was limping badly and I quickly found out that he had stumbled in Rowsley Bar Wood and damaged one of his ankles. This had reduced his speed considerably. Prior to this he was averaging about 3.5 miles an hour but this minor accident had really slowed him down and it was now taking him about 30 minutes to complete a mile. However, there was nothing I could do for him and, as I was trying to beat 8 hours for the walk, I swiftly carried on. I didn't beat the 8 hours I had aimed for, but I was not unhappy about completing the walk in 8 hours and 3 minutes. Larry arrived a few minutes later in a very creditable time of 8 hours 12 minutes. Needless to say all of us had done the walk at an average speed in excess of 3 M.P.H., or one mile every twenty minutes, which is the speed I always aim for. After having the Challenge Walkers' supper of pie and mushy peas, lots of tea and cake; certificates and badges are collected and farewells are said to friends and other walkers. The next stop is the Devonshire Arms at Beeley for a well-earned pint of Black Sheep, which usually goes down a treat.